In early 1958 came the big break David Farr had been hoping for. Radio 6PM conducted auditions for an announcer, for which he applied and won the position. He was appointed to the evening shift, which in the pre-television era was radio’s prime time slot. Other duties included a couple of hours per day writing copy for commercials. A lot of the evening schedule consisted of recorded dramas, soaps, comedies and quiz shows interspersed with music programmes. Some of David’s music slots included The Top 30 Tunes, Among My Souvenirs and The Hillbilly Hour, complete with sound effects and vocal Yahoos!!! In those days audio tape was a relatively new innovation and studio recordings were made on wire recorders or straight to disc. Twelve inch 78 rpm records were still being used with single-use steel needles having to be changed after each play. Dramas, soaps and feature national programmes like Bob Dyer’s Pick-a-Box were all received on large 20 inch discs which were played at 33 rpm with the needle starting from the disc’s centre and moving outwards. They were fun days, but television was looming on the horizon. 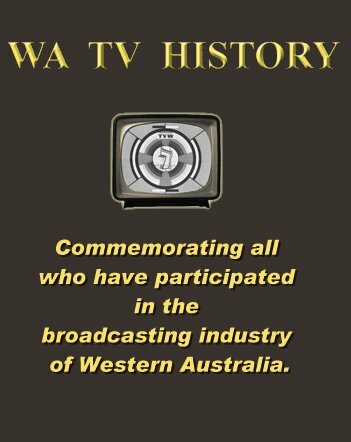 It had been introduced on the east coast of Australia in 1956 and in 1959 TVW Channel 7 was awarded WA’s first tv licence. David’s sister, Janet, had secured a position as secretary to the Programme Manager. A 22 year-old radio announcer who has never seen television is Western Australia’s first TV announcer. TVW Channel 7 programme manager Lloyd Lawson announced last night that David Farr, an announcer with 6PM-AM, had been appointed to TVW. His appointment was the first to be made following auditions last week. Two more appointments will be made later. First TVW appointment of their on-screen staff is former radio announcer David Farr. He will be one of TVW’s newscasters and announcers. Other applicants for announcer’s jobs were still being interviewed this week. Two men whose faces will soon become among the best-known in Western Australia are TVW Channel 7’s announcers, Geoff Walker and David Farr. David Farr (22) started his career as a clerk with a wine firm before switching to radio and then to TV. He was also interested in theatre and had the leading role in “Ondine” in the Festival of Perth two years ago. Mr. Farr was with 6PM-AM as an announcer for about 18 months until his selection from among 250 applicants as TVW’s first announcer. From the Australian Women’s Weekly. 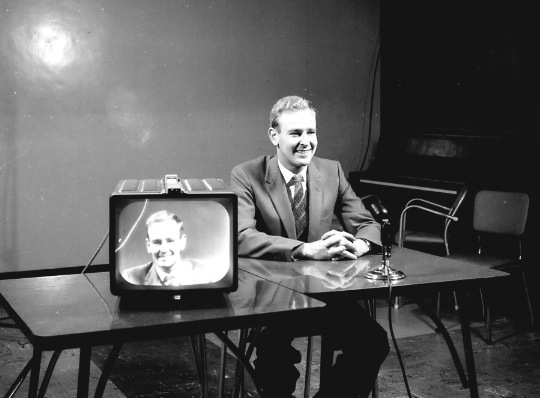 David Farr, aged 22, of Salter Point, WA, was the first news reader-announcer chosen for the TVW 7 staff. This picture shows David, his televised picture, and the camera recording a documentary film. For the first few days of TVW’s auditions David Farr was a man on a tightrope. At the time he was trying to decide whether to accept a radio announcing job offered to him or gamble on getting into TV. After his first audition he thought the odds had lengthened – he felt “very nervous” when he first stepped before the cameras. Only 22, Bachelor Farr had only 18 months of announcing experience with 6PM when chosen by TVW. Other helpful experience includes copy-writing and amateur acting. David says his first job was invaluable. It taught him the value of a smile and pleasant personality – both vital before a camera. David has appeared in two Festival of Perth productions – he played the lead in Ondine last year. Incidental intelligence : “Moderately good” sportsman with a fondness for swimming. His birthplace is Narrogin. TVW Channel 7 will present world newsreels during trade transmissions next week. News editor Darcy Farrell said last night that newsreels would be flown in by the CBS-ITN world service. The half-hour service would start with a news bulletin read by David Farr and then would go into a world newsreel cover. By this stage all the on-air staff had been appointed. In addition to David the other announcers were Geoff Walker from the ABC and Phillip Edgley of the famous Edgley theatrical entrepeneur family. Rolf Harris was appointed to head the children’s programming. In those early days videotape had not been invented so all locally produced programming was “live”. Any necessary pre-recording was done on film which was a costly and non-instantaneous method. The Channel’s opening night on October 16, 1959 went off without a hitch and was an outstanding success with whole families wrapped in rugs crowding the footpaths in front of electrical retailer’s windows, watching this wonderful new medium. The on-air staff had to be extremely versatile, as David’s workload testifies. He was involved in general announcing, news reading, weather presenter, commercials, women’s afternoon host, teenage programme, quiz show compere, variety show compere and children’s show. West Australian television took another step yesterday when TVW7 started its first afternoon women’s session. Here, behind the screen on Televisit are announcer David Farr and hostess Mrs. Joan Wilson reading letters from viewers. Televisit showed signs that it should develop into a good live programme. Hostess Joan Wilson and announcer David Farr did a promising job but the show’s live sections seemed burdened with a heavy load of commercials. Televisit, TVW Channel 7’s women’s session, screened for the first time yesterday afternoon, revealed two promising TV personalities in hostess Joan Wilson and announcer David Farr. David Farr (22) added a lot to the show with his good looks and easy, confident manner. TVW Channel 7 is planning a new live show for teenagers. It is scheduled to start later this month. It will be a late Saturday afternoon show compered by David Farr. Teenagers will dance, probably rock-n-roll, to music by a local group and latest record releases. Last Saturday station executives watched a “dry run” of the proposed show. It is now to go into production. TVW’s new Saturday teenage show is to be called “Rock at Five Fifty”. This gives it a ten minute advantage in time and title over the ABC’s Sydney tele-recorded show “Six O’Clock Rock”. David Farr will compere and Brian Williams will produce and direct. The show’s format is simple. It is basically audience participation. David Farr will add another task to his varied TV chores when he comperes Rock At Five Fifty for the first time on Saturday. He has already been a newsreader and weather-caster, Spotlight artist, booth announcer and host on Children’s Channel Seven and Televisit. Now he’ll be in charge of 30 teenagers rock’n’rolling on the studio floor. But David says he’ll feel quite at home. Care for a Madison? It’s not a brand of cigarette or shirt…it’s a new dance which is sweeping the US. Here Teenbeat comperes Olive Shearer and David Farr practice for a demonstration of the Madison which will be given on Channel Seven’s Teenbeat this Saturday. “Teen Beat”, TVW7’s contender in the TV rock’n’roll stakes, made a promising start on Saturday. It was a smooth debut, and compere David Farr conducted his well behaved guests with competent ease. Just how popular rock’n’roll programmes will be here is yet to be seen. They rate high on Sydney and Melbourne TV stations. Rock’n’roll is booming there, although reported to be waning in America. Two young Channel 7 personalities have been named temporary successors to Rolf Harris as children’s show hosts. They are David Farr and Dianne Briggs. The pair will relieve while Harris spends a seven day motoring holiday in the South West – his first break since joining TVW in September. Wide-eyed, former actress Dianne Briggs is known to WA televiewers for her part in Channel 7’s weekly Spotlight variety show. Man of many parts Farr is a TVW announcer, newscaster and co-comperes with Joan Wilson the afternoon Televisit women’s session. Farr and Briggs do not plan any big changes. Their main aim will be to get the young audience to participate more in the session. Spotlight personality Dianne Briggs will co-compere with David Farr in Children’s Channel 7 on TVW at 5:30 pm today. The two will take over the programme all this week while Rolf Harris has a holiday. 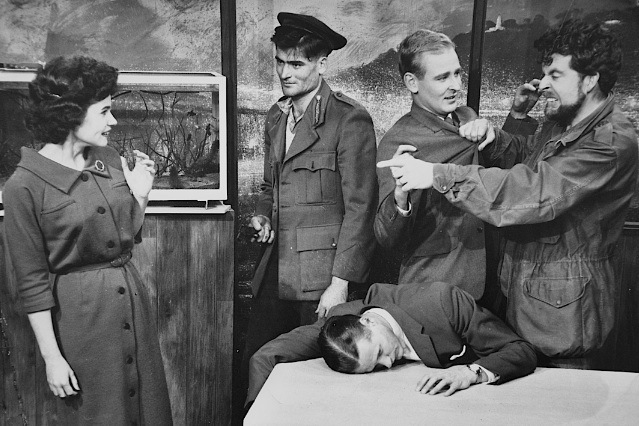 Pam Leuba, Rex Hogan, Davis Farr, Geoff Walker and Rolf Harris in a sketch from Relax with Rolf. Channel 7 is scheduled to start a new local live show next week. A weekly session, it will be the station’s most ambitious project so far. The show is titled Tuesday Date and will be hosted by man-of-many-roles David Farr. It will fill the 9:30 slot on Tuesday evening – temporarily ousting the high-rated Conflict series from the station’s line-up. Channel 7 will present an unusual group of stars on their first hour-long Tuesday Date next week. The South Fremantle football team will appear on film during the show playing….an 18 led by show compere David Farr. What’s the connection with a variety show? “We’re not saying” said a coy spokesman this week. “We don’t want to spoil the gag”. Tuesday Date, TVW’s first regular live variety show since Spotlight, had many good moments last night, but there are still edges to be smoothed. However, with a few more runs Tuesday Date should be one to keep. One of its chief faults last night seemed to be a preoccupation with turning compere David Farr into a Perth counterpart of Melbourne TV personality Graham Kennedy. There were a lot of the Kennedy touches, even including an exchange with the producer in the control booth. However, Farr, while showing promise, is yet no Kennedy. Last night he was given his head far too much. On the credit side, there were some excellent spots. The speeded-up film of Farr training for his football match, and then playing South Fremantle single-handed in a whirlwind sequence, was amusing. It had a Chaplinesque quality. Other spots like Farr miming ads to the voice of Geoff Walker clicked too. The State football team will appear on TVW’s Tuesday Date at 9:30 o’clock tonight. In last week’s film, compere David Farr was shown running wild in a one-man victory over South Fremantle. After the film had been shown, East Perth and State coach Jack Sheedy rang TVW to ask if the station would clear Farr to East Perth. TVW countered by inviting the State team to the studio. TVW’s Oriental cavalcade last night was first rate television entertainment. 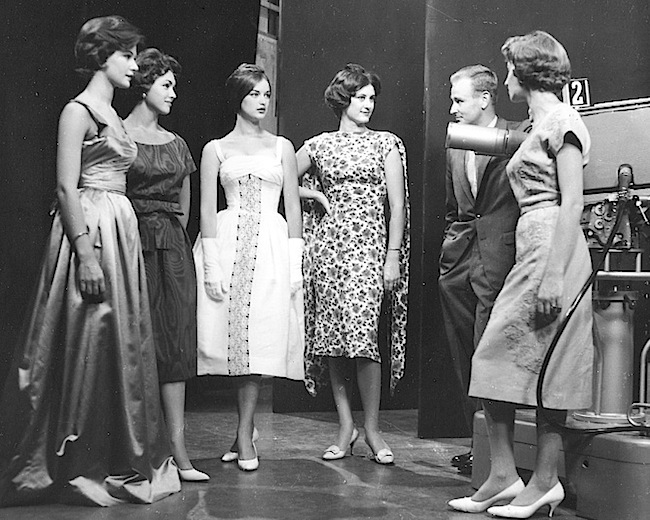 With a wealth of professional talent from a touring stage company to call on, TVW7 made much of its opportunity. Cavalcade skipped through an hour of bright variety. Compere David Farr wisely gave a brief introduction and then let the acts speak for themselves. TVW will introduce quiz shows to Perth television in its regular Tuesday Date programme starting next week. In a noughts-and-crosses quiz contestants will try to answer subjects pegged on a noughts and crosses board. The hour long show, TVW’s most ambitious yet, will include variety at an easy pace. David Farr will compere. The show is also looking for a Girl Friday to work with Farr. TVW will double the prize money in its noughts-and-crosses quiz on Tuesday Date tonight and the winner will stay as defending champion next week. Michael Cole will again be the star of tonight’s programme. Compere David Farr will also be assisted by show regulars Rolf Harris, The Rythm Spinners and the Max Bostock Quartet. By this stage though, after 2 years in the public eye the publicity spotlight was well and truly creating an invasive and unwanted influence on David’s life. He much preferred the fun and anonymity of radio which he had enjoyed at 6PM. Following on talks with TVW management he engineered a career change to the sales department, with the object of working through to a management position. Channel 7 has been harried by calls from viewers concerned about the welfare of former announcer David Farr. Seven has been asked if Farr (a) has been fired, (b) has incurable leukemia (c) cancer. The truth : Farr is in good health, is on annual leave, and will be married within a few months. At his own request he has been transferred to an off-screen job in the sales department, but may be heard or seen occasionally, mainly on commercials. We asked David Farr: “Why aren’t we seeing more of you on TV, considering that you’re still popular with the public”. David’s answer was quick and frank : “I was sick of being on camera”, he replied. We talked with David at his desk in the airy, modern sales office of Seven’s studios at Tuart Hill. This was a David that few viewers know – a quiet, thoughtful David, who prefers his television from the viewing end. We were prompted to question David because his popularity has not waned, though he has virtually been off camera for seven months. He has been doing no more than read the news once a week and give an occasional commercial. However, requests for signed autographs of him continue to arrive at Seven, outnumbered only by those for Lloyd Lawson. David used to compere Teenbeat, conduct Televisit interviews, appear on the now defunct Tuesday Date and do a host of commercials. Now, one suspects, he would not appear at all, if he had his way. 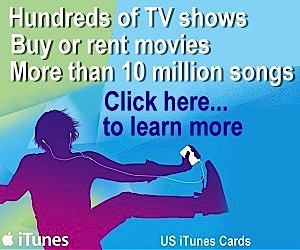 “This decision to change to the sales side of television was mine”, he said. “When I made my reasons clear the channel was with me all the way”. “There is no private life for a TV personality. I found I could not go anywhere without being recognised. This caused me embarrasment. I felt I had to act the part of David Farr – the TV personality, when all I wanted was to be plain David Farr”. Channel 7’s new live show Do You Remember was as uneven in tenor as the era it recalled. There were flashes of imagination and even brilliance in its production. In other places it was as flat as the front of a 1920’s dress. Best moment of comedy in the show was completely unrehearsed. After a free swinging barbershop quartet number (with the Rythm Spinners and David Farr) Farr was so doused with powder and water that he could barely control his mirth in a following commercial. Promotion came for David in 1961 when he was appointed to the Melbourne office of Channel 7 as TVW’s Victorian representative. In 1964 David was transferred back to Perth in keeping with the Company’s policy of 3 year terms in this office. With the move back was a return to some part-time on-camera work in addition to his sales responsibilities as Sales Controller. Gary Carvolth’s Eastern States holiday will bring two familiar faces to greater prominence on Seven. Former newsreader and personality David Farr will return to on-camera work after an absence of more than three years to compere Seven’s Sunday quiz show at 6:00 pm. Johnny Young, rock band leader of Johnny and The Strangers, will replace Gary for two weeks as host of Club 7’Teen. Viewers will remember Farr as a newsreader with TVW7 from its inception in 1959 until 1961. He also compered the live half-hour variety programme Tuesday Date and the teenage programme Teen Beat during those years. In October 1961, Farr went to Melbourne to look after Seven’s sales office and stayed there until May last year. Most people in the world of entertainment like to bask in the glory of being before the bright lights of TV – but not David Farr. Once a popular on-camera personality at TVW7, he gave it all away three years ago. David had been the teenage show compere, the host of evening variety shows and afternoon women’s programmes and a newsreader and weather man. He was undoubtedly a popular young man, but in 1961 he requested to be transferred behind the scenes and went to Melbourne as 7’s sales representative. “I’d always been interested in sales and felt I needed a change”, he explained. Last year David returned to Perth, still on the sales staff, and a few weeks ago he was persuaded to make an on-camera comeback as host of the Vox Adeon Howard Show. People immediately started writing and calling the studios saying how nice it was to see David Farr back again. But we won’t be seeing much more of him. David said: “It’s fun being back on camera, I can’t deny I enjoy it, but my real work is selling so I won’t have much time for other appearances. I’m still working in the sales department five days a week and we record the show on Saturdays which is the only way I could manage it”. TV Times asked David why he preferred selling to appearing on-camera. “Most people think that being on TV is a glamorous existence, but it never was to me. I found it put limitations on me. I prefer the sales department because I’m out and about all day and meeting people,” he said. Anyway, as far as the public is concerned David Farr has made a come-back and everyone seems pleased to see him again. The Vox Adeon Show has been running for nearly three years and TVW are proud of the fact that it is the longest running locally sponsored show in WA. In 1970 TVW bought the 6IX Radio Network and because of his previous radio experience, David was appointed Manager of the network. Mr. David Farr has been appointed General Manager of the 6IX Radio Network. Mr.Farr joined TVW Channel 7 in 1959 and moved to the company’s sales staff in 1961. He spent three years in Melbourne as sales representative and since last year has been TVW’s Sales Controller. Fourteen years ago, WA was hit with its first bout of goggle-box fever – a disease that has run rampant among our citizens ever since. Tonight, TVW7 will celebrate the 14th anniversary of television in the State. 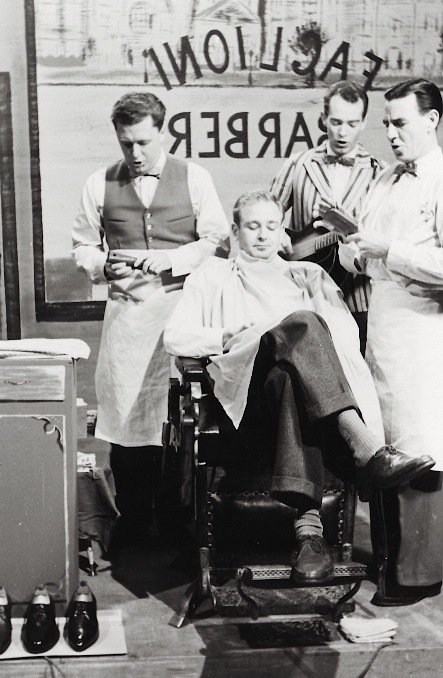 With one studio and a staff of four on-air, the new television station transmitted a programme of TV favourites such as Father Knows Best, Sea Hunt and Leave It To Beaver. The tiny staff had rehearsed solidly for more than a week to ensure the opening went smoothly. According to David Farr, one of the original on-air staff, it did. David is the only one of that group still with Channel 7 and since 1959 he has compered live shows for children and teenagers and run his own variety show. David spent three years in Melbourne as TVW’s representative of the sales team after he moved out of on-camera work. Returning to Perth he was made Manager of 6IX after TVW7 bought the radio station. He has just returned from a trip to America where he spent his time looking at radio station’s ideas and programmes. he says Perth is well up with its US counterparts. 6IX had a programme format of talk and sport, with racing, trotting and greyhound racing descriptions dominating much of its programming hours. A format achieving a steady, lucrative stream of advertising revenue, but one which was not conducive to mainstream survey results. David was able to increase the listener base and during his 5 year tenure at the Network, 6IX topped the audience surveys three times, a seemingly impossible task with its format. In 1975, David and TVW Managing Director, Jim (later SirJames) Cruthers were not seeing eye-to-eye on programming formats with the eventual result that David was promoted side-ways to another TVW subsiduary which had just secured Australasian manufacturing rights to a revolutionary Japanese process capable of reproducing unlimited size photographic-type enlargements. Mr. David Farr has been appointed National Sales Manager, Group Colour Pty Ltd. He will deal with national sales and marketing for photographic services and NECO (a method of processing giant murals). This position necessitated a transfer to Sydney from where he could service more easily the larger revenue base of the east coast and New Zealand. After three years in Sydney, David requested a transfer back to Perth. This was denied and so in 1979, after 20 years with the TVW Group, he resigned from the Company and headed back to Perth. Prominent media man David Farr, the first man to appear on television in WA, is on the move again. Farr has been appointed sales and marketing manager for the Golden West Network and will transfer to Bunbury in early December or in the New Year. A popular media man, Farr has vast experience. He began his career as an on-air personality at TVW7 and transferred to the sales department early in the 1960s. He then went to Melbourne as TVW’s Victorian representative before returning to Perth in a senior sales position. In 1970 TVW bought 6IX and Farr found himself manager of the network. When TVW purchased Group Colour and the Neco process in 1975 Farr was appointed national sales manager, a position that saw him transferred to Sydney in order to better facilitate his position. From Sydney, Farr moved back to Perth to join the Perth office of the Golden West Network, a position he has held working with another top media man, Des McDonald. Now with the move of Ross Elliott from the Network and a small reshuffle taking place, Farr is off to Bunbury. At 44 years of age David Farr’s hectic on-air television career is just a memory. David was the first on-camera face and voice that launched Channel 7 from a tiny office at the West Australian Newspaper’s building in St. George’s Terrace. “It was primitive and raw, but very exciting”, says David. “I had worked in radio at 6PM for three years after a stint with a stock and station company. My involvement with the theatre and the Festival of Perth led to radio. Radio led to an audition for television. I was in from day one”. David laughed heartily as the memories flooded back. “And of course there were loads of commercials. I did dozens of them”. A big step. Forty-one and unemployed. It must have been a very insecure feeling. It has been almost 30 years ago since TVW7 commenced transmission in Perth and Mr. Farr, now GWN regional sales manager, read the evening news. He was a newsreader for two years before moving into the sales and administration side of the industry. Mr. Farr, who was born in Narrogin, worked at 6PM for three years then spent the following 20 years with TVW7 before returning to the country eight years ago. By 1990 David had been appointed GWN station manager and not long after that the Company was awarded the commercial satellite radio licence for Western Australia. This licence was to provide a radio service to all areas of the State not receiving an existing commercial service. In a State the size of WA, this was rather a daunting task. In addition to his television duties, David was also appointed Radio Division Manager and given the task of putting the radio service together with a full-time staff of two! If you have recently visited the outback of WA, chances are you would have tuned into Satellite Radio 6FMS. What started as a small radio network in 1990, has grown into a large quality commercial radio broadcast system heard around three-quarters of WA. Radio 6FMS began with five transmitters located at Kununurra, Derby, Broome, Newman and Kalbarri. The station now sends a signal via satellite to 55 transmitters and nearly 3,000 dish/decoders. The broadcast is heard around the State from Bremer Bay in the south to Argyle in the north. And the signal reaches an audience of more than 90,000 people. Besides music and talk shows already broadcast on PMFM, Mr. Farr said 6FMS content included aboriginal and local news and weather relevent to the broadcast area. People who tune into 6FMS include those involved in the mining, pastoral,fishing, agricultural and tourism industries. The average listening time to 6FMS is 23.1 hours per week, 4.6 hours more than the WA regional commercial station average. Two people working full-time and three part-timers are needed to put the service to air. Its signal can be heard on a vast array of frequencies throughout the State on the FM band. David Farr has seen a lot of changes in the television and radio industry since he first spoke live to air as a radio announcer for Perth’s 6PM, in 1955. Now, after nearly 40 years in the industry, David has retired to pursue his dream of travelling around Australia without an itinerary, following whatever road takes his fancy, staying in places he’s never been before. When David started announcing with 6PM you didn’t need qualifications or experience to get the job, just a good voice. He remembers auditioning for the job and starting work virtually straight away as the station’s prime-time announcer. Working prime-time those days meant announcing from 6:00pm to 11:00pm, after which the station closed for the night. 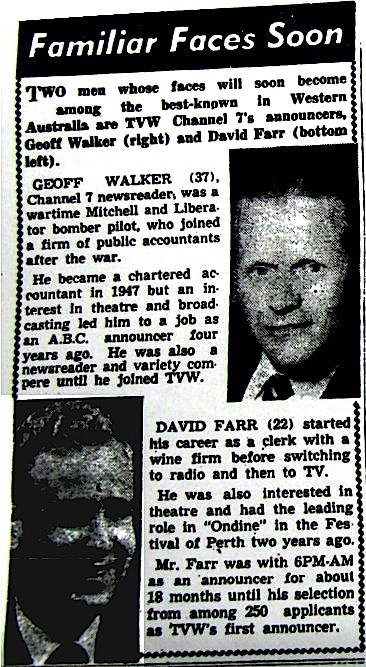 Then television came to WA in 1959 and positions were advertised for on-air announcers with Channel 7, Perth. David applied and was put on the staff payroll. Little did he know that he was to become virtually famous in WA overnight. Television was already established in Melbourne, in 1956, to coincide with the Olympic Games. The first “official” television broadcast in WA wasn’t until October 16, 1959. But there were a lot of “unofficial” broadcasts, mostly news bulletins and black and white test patterns in the months leading up to the official launch. Wherever electrical goods were sold in Perth, crowds of people gathered to stare at televisions on display and wonder at this modern marvel. And the man they were looking at and listening to was David Farr. David holds the honour of being the first person seen on television in WA. David returned to radio when the company bought 6IX, working in Perth and Sydney. He joined GWN in 1979, working in its Perth sales office with two others. A year later he was appointed sales manager and moved to GWN headquarters in Bunbury, eventually taking the posts of station manager and radio division chief. He has seen GWN grow from two television stations in the southwest of WA, with the takeover of stations in Geraldton and Kalgoorlie, the purchase of the Mining Television Network and the launch of satellite transmission throughout WA. He says he’s been very fortunate to have been involved with the growth of radio and television in Australia, particularly with GWN. David said he would spend the next 12 months pottering about his house in Bunbury before embarking on his lengthy sojourn around Australia. When he goes a very special chapter in the book of WA radio and television history will close. A wonderful write up of my boss David Farr. Wow he did all that? I wish him well in his future endeavours, looks like he has a lot. David was my first boss. A great supporter and leader. Hillary was wonderful too!